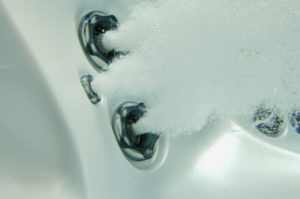 Make sure bacteria doesn’t find a home in your Hot Tub! Warm water, especially warm water that isn’t moving, is a great breeding ground for bacteria. There are a few simple things you can do to combat bacteria. After you’ve finished using your hot tub, make sure all jet ports are opened and water is able to flow through them freely. If you have any diverter valves, turn them half way so that water is moving through every bit of plumbing at once. If you have a waterfall feature, make sure it is opened just a bit to ensure water can move through it. The best way to defeat bacteria is to ensure your sanitizer levels are in the right range and make sure the water is able to circulate. Contact your Beachcomber Hot Tubs, Pool & Patio Water Care Specialist at 403-327-7665 for more information on how to keep your water sparkling clean! Remember, you can bring us a water sample at any time and we’ll provide you with a FREE computerized analysis. For answers to a ton of other questions, check out our Water Care FAQ page. Sign up for our mailing list today to instantly receive a coupon for 10% OFF your next purchase of water care products or hot tub/swimming pool accessories.